How amazing is it that when Rachel & Chris received their wedding pictures, they made it a special night! 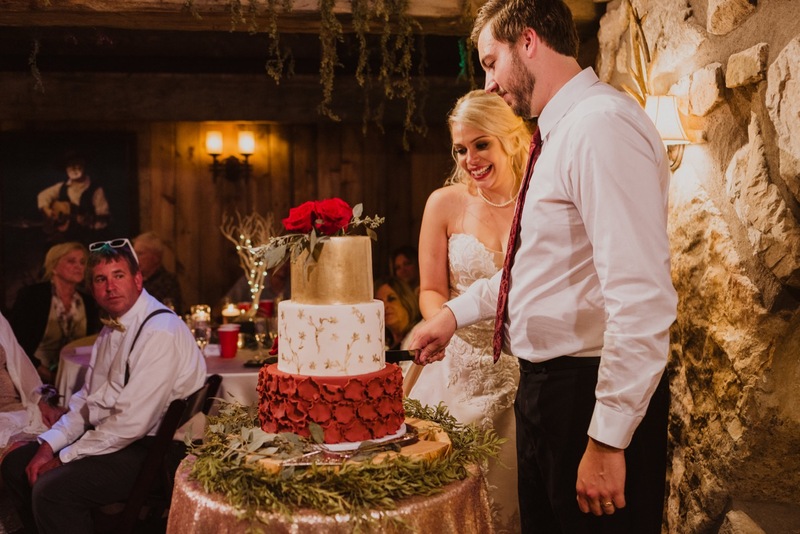 They ate the rest of their frozen wedding cake and opened the last bottle of champagne from their wedding! How did you meet? : Rachel & Chris met in High School. She was close friends with Chris' younger sister, whom constantly encouraged her to contact her big brother. She was really hoping to find a good match for her brother and felt confident she could be the one. Finally, with the help of Myspace, they connected. Yes, social media can bring two people together! Tested and approved. It took only three weeks before they became fully infatuated with each other. “We were by no means romantic, but our connection was unwavering. We became high school sweethearts” said Rachel. How did he propose? : Chris bought an engagement ring a year and a half before he actually proposed. When planning the perfect proposal he had a lot to consider; asking her parents for permission to marry, picking the perfect location, making sure it was romantic, and finding the courage to speak. Chris had picked several places and times to propose, always keeping the ring in his jeans pocket, but nothing ever felt quite right. Valentine's Day, at the Cheesecake Factory; didn't work because there were too many people crowding the room. Rachel's birthday weekend, take her hiking to a beautiful location; didn't work because, oops he forgot the ring. “I am not a girl who likes the spotlight, so the idea of walking down the aisle with a crowd of eyes watching me was the most intimidating feeling. I remember having sweaty palms and taking deep breathes to calm myself while I waited for my entrance. All of a sudden, the music began to play. I had asked my youngest brother to create a song for me to walk down the aisle; I only asked that it would be a mash up of John Denver's Rocky Mountain High and Country Roads. Both songs symbolic because one song is about Colorado, where I am originally from, and the other about West Virginia, where my husband is from. Two songs joined together, just as Chris and I would be joined together. Listening to my brother sing a completely unique song was awing. As my father began walking me down the aisle, I caught a glimpse of my future husband. Suddenly, everything else around me disappeared. I had complete focus on my handsome future standing several yards away from me. I couldn't help but laugh to myself when I saw him begin to cry. For months I told my stone hard fiance’ that he would cry when he saw me, and every time he said there was no way he would cry; he never lets anyone see him cry. Seeing the person you love so much tearing at your sight because he loves you just as much, is a feeling no one can describe. You feel every possible emotion within seconds. Walking towards my future, was my favorite moment of all time”. Thank you to Jason Collins from Simple Times Photography for always being an amazing second shooter! If you would like to see Rachel & Chris’s Engagement Session click here! If you like what you see and you’re planning your wedding click here to get in contact with me! Enjoy!